In 1952 the well-known Texan and founder of the Dallas Cowboys Football Club, Clint Murchison, Jr., purchased Spanish Cay, a small island in the northern reaches of the Bahamas near Great Abaco and developed it into a world-class retreat designed for his personal use and enjoyment. While at Spanish Cay, Clint, Jr.’s primary recreational pursuits included scuba diving and underwater cinematography, and over the years he completed hundreds of dives and collected thousands of feet of unedited film in the crystalline waters surrounding the Island. In the late 1960s he befriended Ed Sabol, the founder of NFL Films, which is the exclusive producer of highlight films on behalf of all NFL teams, and shortly thereafter he commissioned Sabol’s company to produce a professional-grade documentary using his vast film archives. 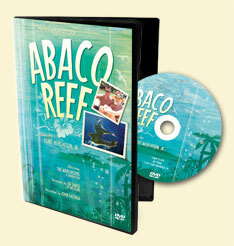 Titled “Abaco Reef”, the resulting production is a cinematic gem. Not only is it professionally edited and set to music, but also it is narrated by none other than John Facenda, the distinguished gravel-throated voice of the NFL highlight films of that era. Plus, as playfully described by Clint, Jr. in the film credits, it stars “the Murchisons and other Fish,” including Clint, Jr. himself, his children – Clint, III, Burk, Coke Anne, and Robert – and his lovely wife, Jane. Despite being only 25 minutes in length, it goes far in capturing the extraordinary variety and beauty of the aquatic life that fills the pristine waters around Spanish Cay. Originally there were two original 16mm color film copies. With the passage of time, the vivid colors in the original film deteriorated and, in an attempt to recapture what was lost, the film has been copied in a DVD format and its color enhanced by computer. While far from perfect, the new version does much to recreate the colorful beauty of Clint, Jr.’s creation.